Encaptured by the stunning views, undulating landscape and granite outcrops, Mary and Bede Gibson moved from their Middle Harbour home in Sydney 10 years ago with a vision of establishing an oasis of peace and tranquility where family and friends could enjoy the charm and fragrance of a country garden. Using her art and fashion design background, Mary designed extensive gardens and walkways to envelop the home, utilising the natural contours and granite boulders of the land. A small orchard and large raised vegetable garden provides a year round supply of organic fruit, vegetables and preserves. In 2013 a studio was completed to cater for special occasion events business meetings and workshops. 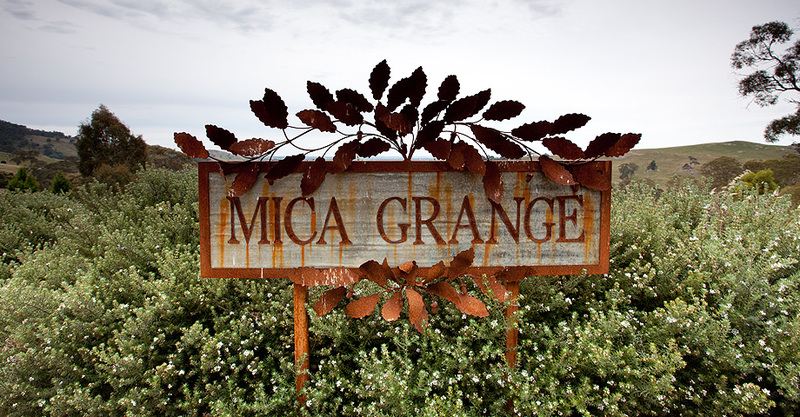 Mica Grange is close to Mt Alexander and offers many picturesque nature walks and an abundance of kangaroos. Travel along the Calder Freeway. 2 kms beyond the Sutton Grange, Metcalfe / Castlemaine, Elphinstone turnoff is Pollards Road. Turn left into Pollards Rd then right on to Harmony Way (Old Calder Highway). Travel 4kms towards Harcourt and you come to Faraday/Sutton Grange Rd (aka Major Mitchell Trail). Mica Grange is 3.73 ks on the left. Travel through Chewton and turn left at Golden Point Rd. Turn left at Harmony Way (Old Calder Highway) and then right into Faraday/Sutton Grange Rd (aka Major Mitchell Trail). Mica Grange is 3.73kms on the left. Turn off the Freeway at Harcourt. Travel 6kms to Faraday on Harmony Way (Old Calder Highway). Turn left into Faraday/Sutton Grange Rd (aka Major Mitchell Trail). Mica Grange is 3.73 kms on the left.